I had some leftover caliper paint from my Cobra brake upgrade that was still good, so my brother made good use of it. The nice thing about these new (reman) calipers is that prep work is minimal. Unfortunately, we soon realized that maybe we should have focused on the exhaust or something else first instead. If we put the brakes on now, the new rotors could accumulate some rust before we manage to get this thing on the road. So for the time being, we’re focusing on the hydraulic stuff like calipers and hoses. The new rotors will stay in the boxes, protected by a sheen of shipping oil. Once the tires are here and it’s ready to drive, we’ll clean the oil off of the rotors, and slap ’em on with the pads. We transferred one of my clamps to the rear/center/upper brake hose, and installed the fresh rear calipers with new hoses. We also strategically applied some anti-seize to the bleeder screw threads in hopes of never ever having stuck bleeders again. 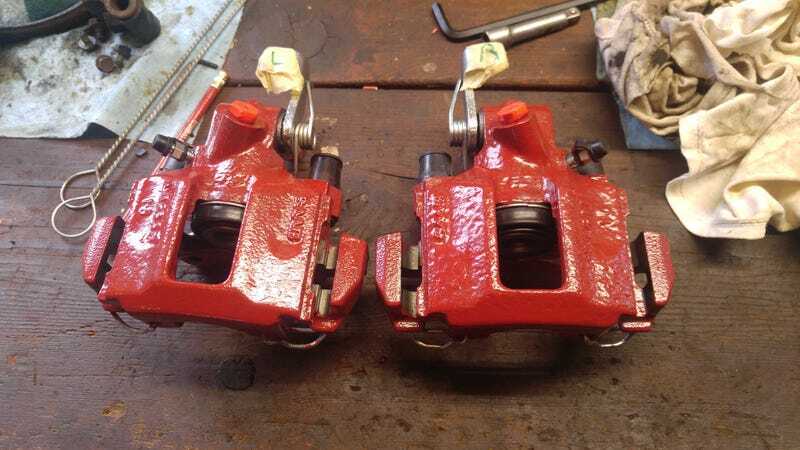 Once both rear calipers were on, we cut the rear/center/upper hose behind the clamp and tended to the rust built up around where it connects to a T-fitting to feed both rear calipers. Once that was taken care of, we were going to have to work quickly to prevent fluid loss and air contamination. With a rag stuffed underneath the fitting to catch fluid, the old hose was disconnected and quickly replaced with the new one. We then immediately got to work on bleeding the brakes before any air had a chance to migrate up to the ABS unit. The book doesn’t give any special instructions or warnings about bleeding an ABS unit that has gotten air in it, but we were careful all the same to avoid that situation and keep it full of fluid at all times. The bubbles soon stopped, but we wanted it to run clear. But after filling this cup about half a dozen times, we realized that we were going to need another quart, at least. So we decided to just focus on getting the air out for now, and move on to the RR caliper. We’ll have to do a more thorough flush later to get it to run clear. I’ve lost count. That’ll have to do for now. At least the air’s out. No start. No crank, even. I checked the solenoid, and while it was making a nice firm CLICK, power wasn’t reaching the other side. Welp, there goes that core refund money.